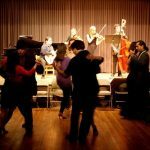 This elegant milonga is held in a beautiful space at the Lake Merritt Dance Center in downtown Oakland. 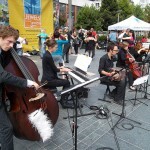 There is a nice sized wood dance floor, easy parking in front of building with security, plus a good spread of snacks. There is a class before hand by rotating local and visiting instructors. 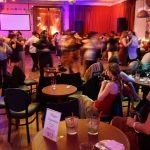 Milonga is from 9pm to 12:30am. Held every Saturday. An elegant space at the Russian Center of San Francisco boasting a superb floor and sound system. Enjoy Art Deco ambiance, and a full bar with Flavored Vodkas, Baltica Beer and Zakuski (light snacks). DJ Glenn Corteza. 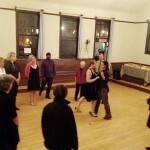 Vecher Tango is held every first, third and fifth Saturday of the month. 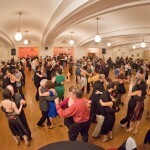 Admission: $17 Class & Milonga, $12 Milonga only, $5 after midnight. The Allegro is a very large ballroom/dance studio with an excellent dance floor. 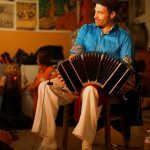 Dancers of all levels feel welcome at this milonga. Held every 2nd Saturday of the month. Class is at 8pm, milonga 9 till 2pm. 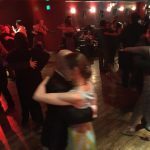 Gustavo and Jesica Hornos, professional teachers from Argentina and USA Tango Champions host La Milonga Sentimental every Saturday (except the 4th). 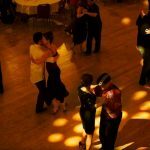 A 1.5 hour workshop is taught by Gustavo and Jesica before the milonga. Gustavo is also an excellent DJ. The Motion Arts Center has state of the art sound equipment, inviting mood lighting and a beautiful and spacious dance floor. Appetizers and drinks and provided but you can also bring your own refreshments. 9pm-1am Milonga Sentimental (The Tango Party) with DJ Gustavo. This event is one of the longest running North American all-nighters and attracts dancers from all over the bay area. It is held on the 4th Saturday of the every month, and is hosted by Homer & Cristina and Felipe & Ayano. There is a class before hand by rotating local instructors or guest teachers. Cost of admission includes delicious snacks and wine as well as hot tea and coffee to provide sustenance for the long night of dancing. Class at 9:30, milonga starts at 10:30pm until dawn. 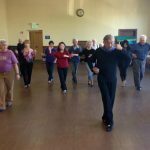 Located in the heart of the Mission, Glenn teaches great foundation classes here and the practica is usually quite popular. The space is cozy, but its a fun and friendly place to learn and practice. Family friendly, Queer friendly, all are welcome!